Maria Aberg's past productions include a kinetic King John for the RSC - which included a Dirty Dancing interlude. Her latest production for the company, As You Like It, opens this week in Stratford-upon-Avon. Maria Aberg is extraordinarily energetic for someone who has spent the last few days in technical rehearsals. From the front of the soil-laden Royal Shakespeare Theatre stage, she bounds up to me as we greet one another and I gush about the amount I loved her production of King John in the Swan last year, with its pop cultural references and postmodern tone. Her first Shakespeare, it was a production which divided audiences and sparked lively conversation. Now she’s back at the company, this time going in completely the opposite direction with her Glasonbury-inspired As You Like It in the larger theatre which acts as one of the centrepieces of this year’s summer season. Like her production last year, Aberg is a bag of exciting contradictions, optimistic yet weary, progressive but nostalgic. Aberg’s excitement and energy are infectious, and though she is worried that “it sounds like I’m saying ‘I’m doing a more conventional production because I don’t want to offend anyone’,” her passion would win me round no matter what we were talking about. Upon meeting her, it’s no surprise that she’s created the anarchic, muddled, celebratory worlds of King John and As You Like It, for these are amongst the things she embodies. Extrapolating further, these are also the things which makes the modern world so unique, so I wouldn’t be at all surprised we see a lot more of her in the coming years. Lead photo by Keith Pattison. 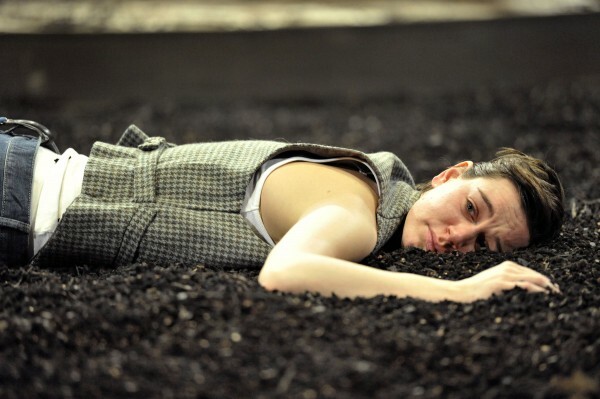 Maria Aberg’s As You Like It is at the Royal Shakespeare Theatre, Stratford-upon-Avon, from 12th April – 28th September 2013. For tickets visit the RSC website.